Jeddah Tower ... funds boost. A strategic partnership between Saudi-based Jeddah Economic Company (JEC) and Alinma Investment is expected to give a push to the Phase One development of Jeddah Economic City, a multipurpose project coming up in Obhur, just north of Jeddah on the Red Sea coast. 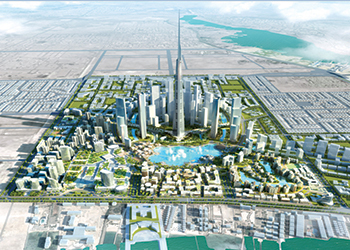 The companies have signed a deal to initiate a SR8.4-billion ($2.23 billion) fund, which aims to complete construction work on Jeddah Tower – previously known as Kingdom Tower – as well as a number of major real estate projects within the development owned by JEC. Currently, 26 floors of Jeddah Tower, which occupies an area of 85,000 sq m, have been completed, said Mounib Hammoud, chief executive officer of JEC. “With this deal, we will reach new heights unheard of as yet in real estate development. This will also help us fulfil the company’s objective of creating a world-class urban centre that offers an advanced lifestyle, so that Jeddah may have a new iconic landmark with comprehensive services and a multitude of uses,” he added. Jeddah Economic City – which was previously known as Kingdom City – has been designed to accommodate a comprehensive range of facilities supporting a modern lifestyle over its 5.3-sq-km development. The first phase to be constructed over 1.5 sq km will accommodate more than 3.3 million sq m of modern and multipurpose structures, which will form the nucleus of northern Jeddah’s downtown, bolstering the city’s standing in the world. Alinma Investment is a SR1-billion ($266 million) Saudi limited liability company that will be funded by Alinma Bank. While Alinma Investment will manage the fund, JEC will be the master developer of projects that will draw on the fund’s credit lines. It has bought out in entirety the fund’s units.